Fog City Blues first went on the air on Monday, January 29, 2007 (oy, at 11 pm!). Its mandate from KALW was to provide a local forum for blues in the Bay Area. For me it was a sort of homecoming, if not part of a dream come true. I'd been working for almost a year on another KALW program, Philosophy Talk (of which I am currently Producer). I came to that show after finishing a doctorate in Linguistics at Cornell but with little formal radio experience beyond a blues show I'd had in college (at WOBC in Oberlin OH), Rags, Stomps & Blues. Fortunately the Senior Producer of Philosophy Talk was also the Producer of the House of Blues Radio Hour (with Dan Aykroyd), so the arrival of an unemployed PhD with a blues background felt like an aligning of the stars. About a year later, KALW came asking if we were interested in filling a recently-opened hole in their blues schedule, and Fog City Blues was born. I'm told that 'radio' was my first word in life (pronounced 'beydjo'), so I never saw the jump from academia to radio as anything but fate; in fact it's kind of a miracle it didn't happen without the dissertation being finished. And it certainly helped to find an egghead program to ease the transition, keep my finger in the academic pie, and begin my life's work integrating music and language scholarship on the radio. But while Philosophy Talk is a full-team multi-pronged day-job, as it were, Fog City Blues is my full-time one-man sideshow. Of course that's a bit disingenuous: most of the great moments on the show have been brought to you by people other than me, particularly the artists and musicians who've generously stopped by the studio to talk and/or play on the air. And those moments have been anything but sideshows. I've been privileged to spend time on the air with a few national and out-of-town acts who've passed through these parts (including a pair of Canadian bands of some renown that I followed back in the day). But it's the local Bay Area artists who give the show its real flavour, several of whom have stopped by more than once. The quality and diversity of blues-ish music in the Bay Area is staggering, and for this week's anniversary show, we'll check in with a suite of past guests who capture some of the breadth that the program aspires to: Elvin Bishop, Quinn Deveaux, Mark Hummel, and Miss Carmen Getit (of Steve Lucky & the Rhumba Bums). We'll also hear some past in-studio performances to help fill out the picture of what's gone down in five years of Fog City Blues. And it certainly doesn't stop with the anniversary. Next week it's Howell Devine live in the studio, and Con Brio the following week. We are just getting started. A radio program, at least the kind I'd like to host, needs to tell a story. Even when the show is made up of a set of self-contained stories -- the songs on a playlist, say -- I need there to be a story arc with a sort of narrative progression through the at least some portion of that playlist. But does a sequence of songs from blues artists with upcoming Bay Area shows create a compelling enough story? How can that sequence be punctuated with other music that both flows and keeps listeners (pleasantly) surprised? Fortunately, it's often made easier with the help of talented musicians from near and far who join me on the program. They tell the story and make the connections in real time, either through their own music or through a guest-deejay set of inspired tracks. But in either case the goal remains: to craft a sequence of music that's greater than the sum of its parts, while making sure each of those parts is illuminating and inspired. In another setting, each show would be a mix-tape designed to woo. And I do hope that Fog City Blues woos -- and surprises -- someone new each week. 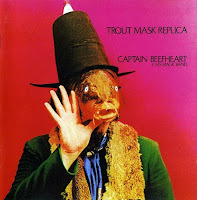 Inside the National Recording Registry: Captain Beefheart's "Trout Mask Replica"
Dori Caymmi et al, O Que É Que A Baiana Tem?